The original and definitive Meccano part. The two original ideas that Frank Hornby realised in the Meccano perforated strips were to place equidistant holes all the way along each strip (other toys had holes at each end and other variations), and to make each hole act not only as a bearing for axles, but also as a connection point for nuts and bolts. Radiused (left) and truncated (right) ends of Meccano strips. Strips longer than 5½'' long are a thicker gauge metal than the shorter strips, and they have 'truncated' ends rather than fully rounded or 'radiused' ones. 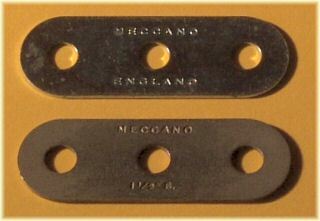 Longer strips have the stampings "Meccano" and "Made in England" across the width of the strips – in this example the 12½'' one has both stampings, one at each end. The 9½'' strip only has "Made in England", the 7½'' only "Meccano". In the late 60's the 12½'' strip changed from truncated ends to radiused ones. Shorter strips (5½'' and shorter) have "Meccano Made in England" stamped along the length of the strip, centred in the strip, except for the 2'' strip which is stamped off-centre (this seems to be very common). In around 1973 the 2" strip gained an extra fifth hole in the centre. Starting in 1976, 2½'' strips had truncated ends (as shown in the longer strips above), due to a change in the press tool used. Perforated strips were included in the very first parts manufactured as MME (before the name Meccano started in 1907). They were tin-plated thin steel, with folded-over edges. In 1908, the parts changed to thicker gauge steel without folded edges, initially tin-plated, then nickel-plated from 1909, then painted from the 20's onwards. 20's nickel stamped "Fabrique en Angleterre"
45-57 medium green, stamped with the post-war "Meccano Made in England"
Missing from this photo are (among others) the early 1906 tinned steel variety (looking much like the earliest nickel one above), black japanned versions from 1919, 70's Army and Combat multikit olive green, 78/79 dark blue, and post-80's varations in red and other colours. Note that the stamp is the same for the gold and mechanised army parts (top row last two), and is the same for all the post-war UK-production strips (bottom row all except the last one), even though the stamping is very feint on some of these. 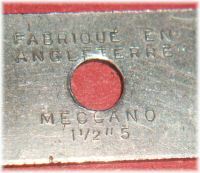 The French Meccano has a much larger rounded font for the "Meccano" stamping. Current production of Meccano uses this same font but says "Meccano (N)", signifying the new owners Nikko. Although the thickness of strips does vary, there appears to be a significant thinning of strips during the war. The picture to the left shows pre-war medium green strips (1933-on) to the left, and post-war strips (1945-on) to the right. The post-war strips are about 15% thinner. The top of these two 1½'' strips is a fairly common 1970's zinc-plated strip stamped "Meccano England" (rather than "Made in England"). The lower is much more interesting, a nickel-plated strip from the 20's which is stamped "Meccano" above the central hole, and "1½'' S." below it. I have never seen reference to this stamping before (or seen it on any other part other than a 6a), does anyone know anything more about this? It seems to be the only Meccano part I know of that is stamped with its description! A range of perforated strips in their 'spare parts' boxes. At the top is a wired-together bunch of a dozen of part number 1, which I believe would have had a white paper label wrapped round them? They are tied together with thin mild steel wire, once through the holes and once around the entire strips, then twisted together. Below these are brown-paper wrapped parts 1 and 2a from early post-war, then to the bottom left the later medium-green boxes with yellow labels, and to the right the later yellow boxes with green labels (showing these to be 1958-onwards light green parts), and in the bottom right the lighter yellow variation of these boxes. Note that there isn't a box for each size of parts, the left-hand 2'' and 3'' strips are in the same sized box, and the centre-right 2'' strips are in the same sized box. The dead centre 3½'' strips are in a box that is thinner and wider but the same length, the 4½'' strips at the bottom right are in a box long enough to fit 5½'' strips. To the right is shown a pre-war pack of 5½'' strips, part number 2. These were wrapped in brown paper and sealed with a printed red-on-yellow scalloped sticker. The parts here are gold, dating them from 1934 to 1941. And here are some more gold pre-war strips, this time part 5 (2½'' strips). Note that the label this time is a diamond, more like the post-war stickers, but still red on yellow. This might be a later version than the one shown above. Total number of messages on this page: 14. This is page 1 of 3. I have a nickel plated 4" strip. It came with a collection of nickel plated parts and looks genuine, although not stamped Meccano. does anyone know, if a similar perforated strip smaller (about 3mm wide) exists in roll form? What would its name be? Found this meccano stuff which is close but a bit too large for my crafting. Have looked all over. (Sometimes sold as jewelry connectors but too short, would like a roll of it). Anyone have a clue if it exists and what industry its linked to? Perhaps a little out of place but........how do you tell the difference between Trix and Meccano X parts? I have several green 3-hole strips from the dark green pre-war era marked "Fabrique en Angleterre" and with the curious 1 1/2 S stamp. So it went on some time after the nickel years.